Free Video Reveals The TOP Marketing Experiments That Will Increase Your Traffic, Conversion And Sales Online! My TOP 4 split tests that are SO simple, and you can setup in minutes that will DRAMATICALLY increase your conversions! The "secret step" that I add BEFORE my funnels that allows me to know EXACTLY how to sell to each customer! 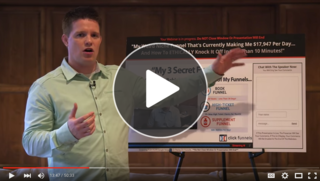 The 3 core funnels - 98% of our income came from just 3 funnels. If you're focusing on anything else, you're just flushing your money down the toilet. Where Should I Send Your Video Presentation? Create Amazing Image Based Headlines To Increase Your Conversions Instantly! Signup For The Funnel-U NOW... And Get Your FREE Copy Of 'Image Headline Generator' Now!!! Signup For The Funnel-U NOW... And Get Your FREE Copy Of 'Funnel Stacking: The 3 Core Funnels' NOW! 2nd) The Digital Access Pass is Going Away SOON! Because I do NOT want everyone to have all of the back archives of our past Funnel University newsletters, the Digital Access pass will be removed from this special offer VERY soon. If you don't lock in your membership NOW while this page is live... you'll NEVER be able to get back to this private members area. I'm mailing you my new book, "Funnel Stacking" along with a bunch of gifts when you join Funnel University right now! You'll get a FREE 14 day trial and get EVERYTHING listed below when you get started today!